Rings There are 24 products. Unique author's, hand made leather rings made of muti colour, natural amber pieces, which is decorated with exclusive leather compositions. Smoothly polished, clear and matte amber pieces with sparkling air bubbles frozen inside , surrounded by wavy leather. 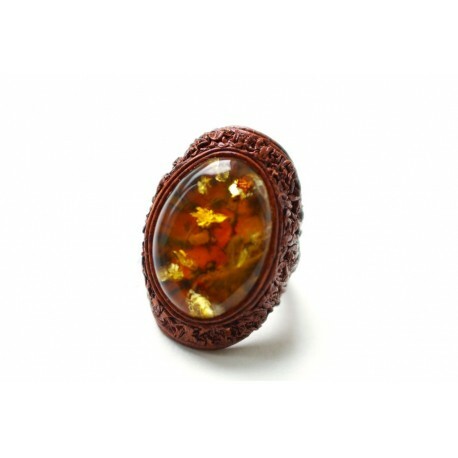 Rings with impressive smaller or bigger size peaces of amber laid in leather. Hand-made, brown (copper colour) leather ring with white amber, so called "The Lithuanian Gold". This ring, with an exceptional design, will make Your image solid and original. The size of this ring is adjustable. Brown leather ring with white amber "Nut"
Hand-made, dark brown leather ring with white amber, so called "The Lithuanian Gold". This ring, with an exceptional design, will make Your image solid and original. The size of this ring is adjustable. Brown leather ring with white amber "Coffee"
Hand-made, an original, black leather ring of an adjustable size with white colour amber, so called "The Lithuanian Gold". The ring has an exceptional design - an applique of the red leather rose petals. Contrasting, memorable combination. In our online shop You can buy matching necklace and bracelet as well. 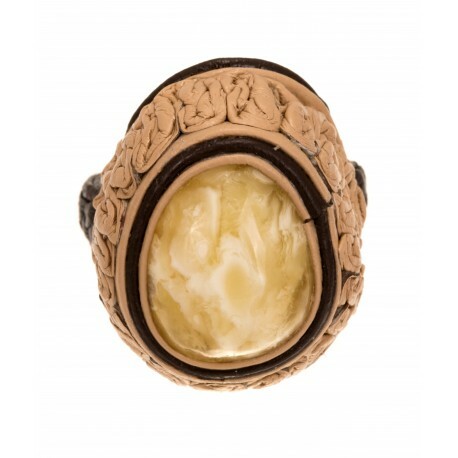 Handmade ring of the sand-colour, wrinkled leather and the embossed, white amber. A black gloom leather ring with cognac-colored amber. Hand-made black gloom leather ring with prominent cherry-colored amber. 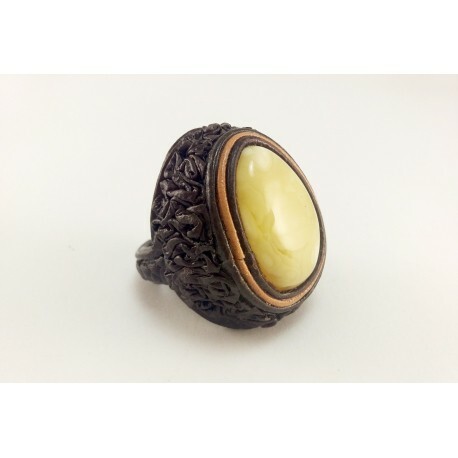 Light brown color gloom leather ring with lemon-colored "scaly" amber. Light brown color leather ring with transparent, sparkling, greenish cognac-colored amber. Black gloom leather ring with yellowish-green amber. Moss green color gloom leather ring with transparent, glassy cognac-colored amber. 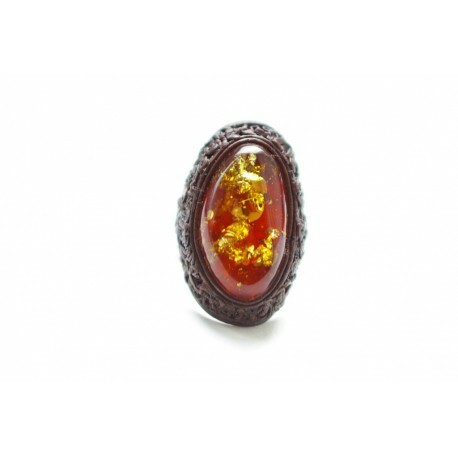 Dark brown color ring with prominent transparent yellowish amber. 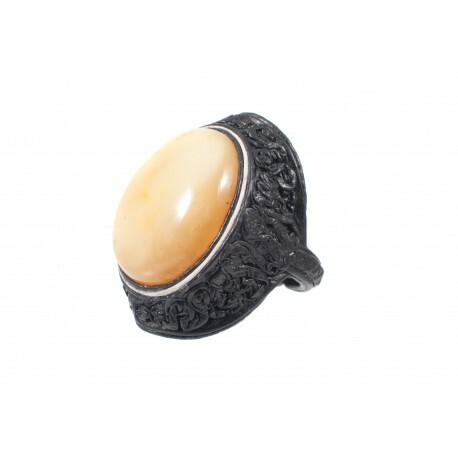 Author's black gloom leather ring with prominent lemon-colored amber. Black soil impurities visible in amber inlay, give a green hue to the amber. Author's black gloom leather ring with prominent reddish cognac-colored amber. 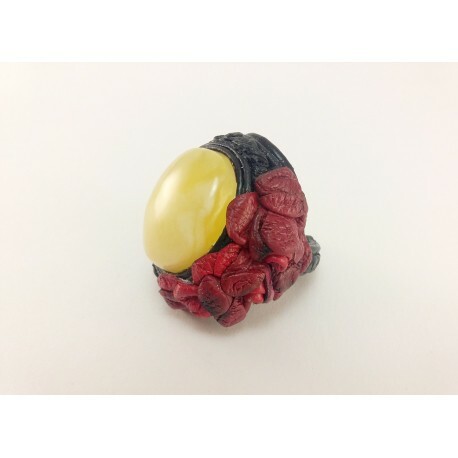 Author's black gloom leather ring with oval light yellow-colored amber. 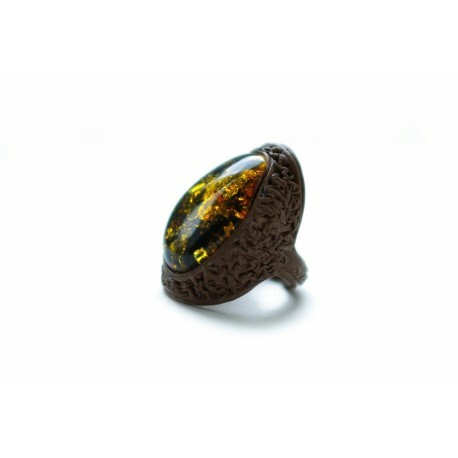 Light brown leather ring with "scaly" greenish-brown amber. The flakes provide amber with a shade of sparkling golden sun flashes. Author's black gloom leather ring with the prominent green amber framed in white leather string. Author's light brown leather ring with prominent dark cognac color amber. A single brown gloom leather ring with prominent cognac-colored amber. In transparent amber there are moss impurities and wood bark chips visible. 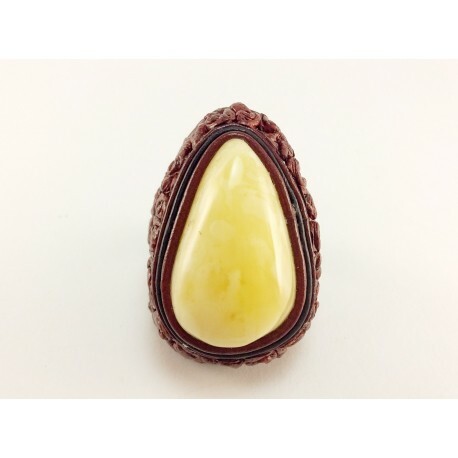 Chocolate color ring with cognac-colored amber. There are some bark fragments left in amber and they create a unique, distinctive pattern.